Lupines (Lupinus spp.) are a group of native North American wildflowers. A number of popular landscaping cultivars are available along with the wild species, all of which are dramatically beautiful in both flower and form. There are two broad classifications of lupines - those that grow in the arid conditions of the west and those that are adapted to the humid eastern part of the country. The former thrives in dry, rocky soil and is adversely affected by irrigation and fertilizer, while the latter is more at home in typical garden beds that are enriched with compost and watered regularly. 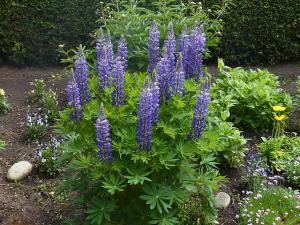 For this reason, most of the popular hybrid varieties of lupine seen in nurseries are bred from the latter group. All lupines have palmate leaves, meaning there are many little leaflets that are grouped together at the base, somewhat like the fingers of a hand or a palm frond. Flowers appear throughout the summer on thin conical spikes above the foliage; purple is the color most often associated with lupine, though white, pink, yellow, magenta, blue and other shades are available. There are a few wild species with particular interest to gardeners. Sundial Lupine (Lupinus perennis) is a species found from Florida to Maine and west from Minnesota to Texas. It is an herbaceous perennial with clumps of leaves 12 to 18 inches tall and enormous flower clusters that rise an additional 12 to 18 inches above the foliage. It thrives in USDA zones 3-9. Tree Lupine (Lupinus arboreus) is a West Coast native that grows as an evergreen shrub three to four feet tall and wide, typically with purple flowers. It is suited for USDA zones 7-10. Annual Lupines (Lupinus spp.) come in a small number of types that grow throughout the country. Typically less than a foot tall, these are often seen in wildflower seed mixes. 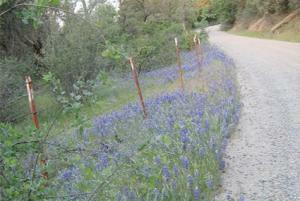 All zones work well for growing the annual lupines. Silver Lupine (Lupinus albifrons) is an evergreen perennial native to cliffs and mountainous places of the western U.S. The leaves of this species are covered in tiny hairs that reflect the light, giving them a silver or whitish appearance. Grow it easily in USDA zones 8-10. Growing requirements vary based on the type of lupine being grown, but all varieties are useful in wildflower meadows, cottage gardens, and perennial borders. 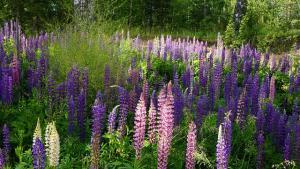 All lupines need full sun to thrive and flower abundantly. Native lupines thrive with little to no care in native (unenriched) soil in the regions they originate in. The herbaceous varieties should be cut to the ground after the first hard frost, while the shrubby evergreen species can be trimmed back about 25 percent each year after they flower. The annual species should be left to go to seed at the end of the year; their foliage will wither and disappear on its own by spring. Native lupines are only suitable for planting in the region they come from, where they are typically available in local nurseries, especially those that specialize in native plants. The hybrid cultivars listed below are much more finicky than the wild species. They prefer cool weather, rich soil, perfect drainage and regular irrigation. They are very difficult to grow in hot or arid places; the northern half of the country provides the best environment for these lupines. Transplants are often available, but the roots are very fragile so many gardeners elect to grow them from seed directly in the bed where they are too grow. 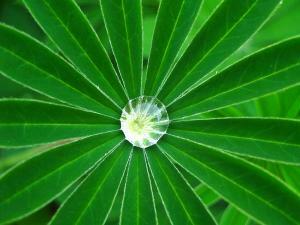 Lupine seed germinates readily, though soaking it in water overnight before planting will speed up the process. 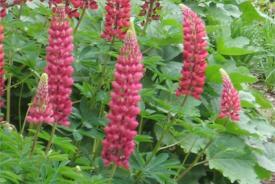 Seed of lupines hybrids is commonly available from seed companies like Swallowtail Garden Seeds. Plant the seed or potted specimens in beds of rich, loose soil. Allow the top few inches of soil to dry between waterings, but do not allow it dry out completely. Try to water at ground level and avoid getting the leaves wet, as this tends to spread disease. Lupines are legumes, which means they produce their own nitrogen, so it's best to withhold fertilizer. The flowers are so large that they often need the support of stakes or a thin wire cage to keep from falling over. Cut the spent flower stalks and foliage to the ground at the end of the season and spread a layer of compost as a soil-enriching mulch to protect the crown of the roots over winter. Powdery mildew is the only pest or disease that commonly afflicts hybrid lupines. It can be treated with fungicides, but is generally a sign that the location is either too hot, too wet, or the air too stagnant (or a combination of these factors) for lupine to perform well. 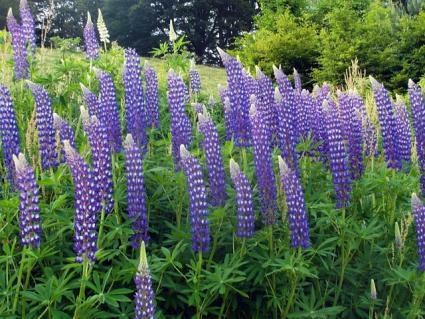 The lupine hybrids listed below have the largest, most stunning flowers but require ideal growing conditions to succeed. 'Russell' contains a mix of lupines that grow two to three feet tall and include colors ranging from salmon and cream tones to deep purple and magenta in USDA zones 4-8. 'Band of Nobles' is a mix with similar flowers to 'Russell' but it grows four to five feet tall in USDA zones 4-8. 'The Pages' has pure carmine red flowers on plants about three feet tall in USDA zones 4-8. 'The Chatelaine' grows to four feet with bi-color pink and white blossoms in USDA zones 4-8. Always pointing skyward, lupine flowers have a happy, alive presence in the garden. Lupine's tall thin spires of color also make great cut flowers for a tabletop bouquet.